See if this sounds familiar: Someone e-mails you a document, contract, or whatever that requires your signature. So you print it, sign it, then dust off the fax machine so you can send it back. Talk about a waste of time (and paper). Isn't this the 21st century? Why are we still messing around with printers, hard copies, and--horrors--fax machines? Adobe has been working to combat this old-school tech via its eSignatures technology, but until recently it required you to work within a Web-based interface -- not always the most convenient environment. Thankfully, the company's newly updated Adobe Reader for desktops, Android, and iOS features full eSignatures integration, meaning you can now sign and send PDF documents much more easily. For example, the new and improved Reader lets you sign a document right on your smartphone or tablet, just by drawing with your finger. 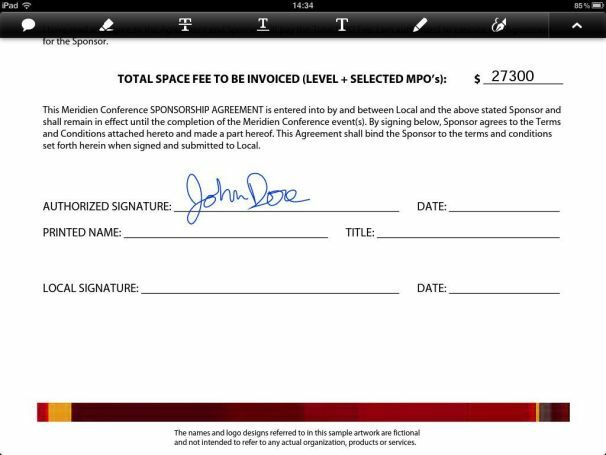 And if you're the one seeking a signature, you can connect to Adobe EchoSign and send a PDF to someone else. This not only allows you to track and manage your document, but also to archive it in the cloud and access it via Web browser. Other newly added Android/iOS features include text markups like highlighting, strikethrough, and underlining; support for Sticky-Note comments; and, hallelujah, support for filling out forms (which can then be saved and sent). If you haven't tried eSignatures before, it's pretty cool. Each recipient of a particular PDF gets to review the document, then apply his/her own digital signature. Along the way, the document retains Adobe's certification to prevent any unauthorized alterations. If somebody does make changes, the certification tag no longer appears. If you're concerned about the legal validity and trustworthiness of electronically signed PDFs, Adobe has a FAQ page devoted to EchoSign security. Adobe Reader is still free, of course, as is eSignatures. My two cents: it's ridiculously convenient, a zillion times quicker and easier than the ol' print-sign-fax method. The 20th century is over, people. This is a technology whose time has come.